See, roulette lulls you into a sense of certainty in that, most of the time, you have a 50/50 shot of doubling your bet if you bet on either red or black. It's just about a coin toss. Similarly, I'm at the stage in this parenting gig where my three-year-old daughter's behavior in public is about as predictable. There's a good chance that she will act reasonably and acceptably. She will probably be fidgety and not really want to sit still. She will also likely talk at a voice two notches louder than I'd like, but she won't be shouting or crying or screaming, and it will all be okay. She'll say hi to every stranger we pass and ask for candy 153 times before we get out of the store, but she won't throw a fit when they don't talk back or she doesn't get a pack of Skittles. All-in-all, it's predictable, good behavior. We'll call that landing on black. The other half of the time. She will be pretty terrible. I'll try to walk with her holding my hand, and she will go limp like a passive resistance protester so that I look like a monster dragging her along behind me. She will knock bottles of shampoo to the floor and run from me until I corral her and try to put her in the seat of the cart. At this point, she will lock her knees into boards and shriek until everyone in the store is staring at us. If I'm alone, I'll grab ten of the thirty-five things on my list and hope it is enough to get through the next few days. If my husband and I are together, one of us will take her to the car where she'll either fall asleep or scream until she runs out of breath. We'll call that landing on red. 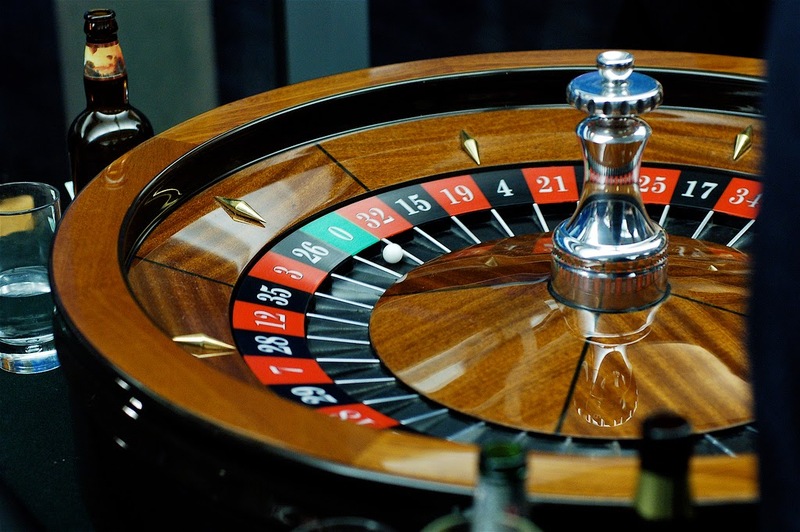 While there are some telltale signs that can help you figure out which way the day might go, most of the time I really do feel like I'm taking a gamble just as much as I would be at the roulette table. Sure, if she hasn't napped, red is looking more likely. If she got to run around at the park and burn off some energy, we may be looking at a black kind of day. But the predictability is very limited, and these might just be the talismanic habits of a gambler, like a woman I once saw who filled her BINGO table up with stuffed animals and ritualistically tapped each one on the head as the numbers were being called. We all want to control the fates, but usually we just get what we're given. 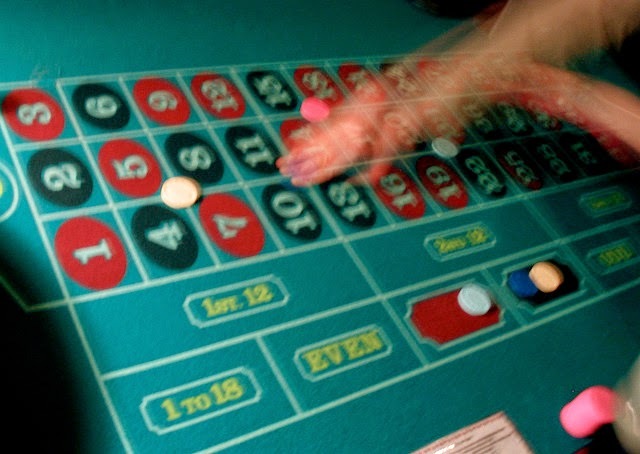 Roulette, though, is not actually a 50/50 game. It's not all red and black. There are two wildcards that throw off the odds. You could also land on the green 0 or 00. These are not safe bets. They are rare, making up only a tiny portion of the possible outcomes on the board, but they can wreak havoc on your preparations or reward you with riches. See, you can split up your bets on roulette, putting a good chunk of chips on black, a handful on individual numbers, and--sometimes--one or two on the 0 and 00, just in case. Much like the green roulette squares, the 0 and 00 of parenting a three-year-old is not something that you rely on. It is something that you prepare for just in case. See, every once in a while, my daughter does not have a predictable, manageable tantrum. Instead, she has a full-out, red-faced, scratching, kicking, drag down, battle royale style meltdown. There is no preparing for this. It's like when you put all of your chips on black and it bounces out of the black one and into the green. Game over. On the flip side, sometimes you've thrown a few chips down there on green just in case and you are pleasantly surprised. You go into the store and she quietly and politely holds your hand, not touching anything she isn't allowed to touch and speaking to strangers gently and kindly. You weren't expecting this kind of payout, but it was nice to have the chips there when the wheel turned. I had the chance to watch the wheel turn and turn and turn this week as I took my daughter on vacation. It was a whirlwind of back-to-back-to-back trips that included five flights over seven days (including layovers). There were beaches and hotel rooms and delayed flights and dropped candy and security lines and staying up past bedtime and time zone changes and meeting new people and cartoons and a whole barrage of experiences that spun that roulette wheel around and around. I never knew what I was going to get. There were times when I was completely prepared for a meltdown and she sat perfectly quiet and still, coloring a book for almost the entire flight and staring out the window for the rest. There were times when I thought we were in the clear, and then she started kicking the seat in front of her until I had to physically hold her legs together across my lap to get her to stop. I tried to hedge my bets by filling up the carry-on luggage with books and movies and candy for bribing. Sometimes they weren't even needed. Sometimes they worked perfectly. Sometimes they didn't even make a dent in the crisis. My hope is that these ups and downs are signs of a leveling off. There was a time when I knew I would get a meltdown no matter what, so I didn't dare get on a plane. But now we're in a true gamble. Sometimes we hit the jackpot, and sometimes we go home busted.